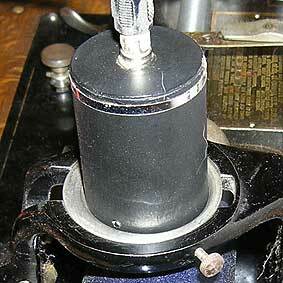 This barrel shaped plugin for Edison phonographs is equipped with an eletric pickup. 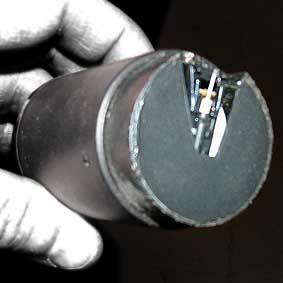 It is partly hidden in the barrel, and it is not possible to see what model it is. The rest of the interior of the barrel is a mystery, too. The barrel is made of plastic, but without opening it, is's impossible to know whether it contains just the cable between the pickup and the connector on top of the barrel, or something else. 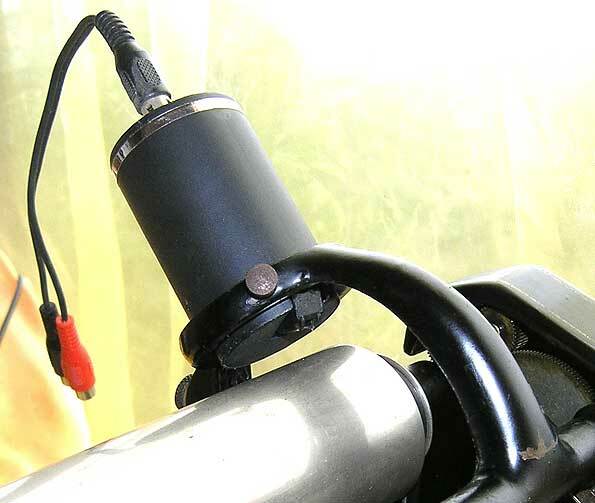 The barrel fits Edison phonographs with the smaller ring, and if you want to use it on one with the bigger ring, you will need an adapter ring. Such rings were manufactured by Edison from 1911. The device was sold by Jean-Paul Agnard to Bruno Garnier, who provided the pictures. The bottom of the barrel with the electric pickup. Most of the pickup is hidden, and the model marking can not be seen. The barrel plugin mounted on an Edison phonograph with the large ring. The steel adapter ring ir clearly visible.